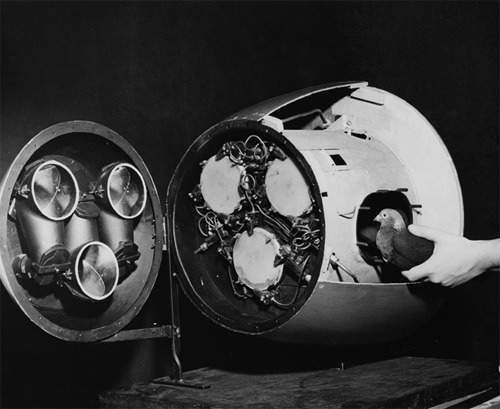 The Gist of the device was to place three specially trained pigeons into compartments in the nose of a missile where pressure sensitive screens would display images of what was in front of the missile projected through lenses in the nose cone. Provided the missile was fired in the right general direction so the target was visible, the pigeons would then peck at its image on their individual screens. If the missile was off target the pecks would be to one side of the screen or the other, and this would cause the missile to correct its course in the indicated direction. Steering was by majority vote just in case one of the pigeons should panic. Skinner had notable success in training his pigeons, but a good deal less success in getting anyone in the military to take his idea seriously. In the end the development of reliable inertial guidance systems rendered project Orcon redundant, and Skinner went on to prove that his pigeons were capable of forming superstitions. Which given how close they had come to being fired at enemy ships on the end of rockets shows they were a good deal smarter than a lot of people gave them credit for! The pigeons were not navigating the missile using their homing instinct, just pecking at an image on a screen. when they saw the target on the screen, they pecked at it and this input was used to correct the missile's flightpath. The pigeons did not need to know where they were going, just to be able to see. Skinner's specialty was training pigeons, or lab rats, or whatever, by means of his "Skinner Box," which rewarded an animal for following instructions by opening a hatch that released a small amount of food. The article doesn't say so, but I'm assuming that the missile was supposed to work on this principle. One obvious flaw here is that a pigeon orients its homing instinct by means of detecting changes in the Earth's magnetic field, so if there was anything in the missile that generated its own magnetic field, the pigeons would be useless in aiming it. Bizarre doesn't begin to describe this, aside from the senseless pigeon deaths that would result. Not to mention the fact that said pigeons would need to be trained for this. I swear, the pigeon in the picture has an "um, you want me to do what?" look on his face. What's remarkable about B.F. Skinner is that he was able to get anyone in or out of the military to take his "Behaviorism" seriously; however, he did, and his ridiculous theories still have some followers today. But he lived in an odd era of major psychological/scientific/medical con artists and credulous believers— two other notable examples being Wilhelm Reich and L. Ron Hubbard. Only thing i have to say... WOW.